If you’ve ever found yourself wandering the shops of Lakeway Commons, chances are the entrancing finds at Eco Estate Jewelry have caught your eye. Their jewelry collections make it impossible to not step into the store. The shop — which they are quickly outgrowing — opened in June 2015. They recently celebrated their first anniversary with a sensational bang! Trays of white wine and champagne sparkled like diamonds as lucky Lakeway residents nibbled on hors d’oeuvres and cake pops. Out front a banner from the Lake Travis Chamber of Commerce adorned the drive and a ribbon cutting added to the festivities. Eco Estate Jewelry is jam packed with a plethora of earth-friendly antique and estate jewelry. Earrings, bracelets, and necklaces are just the beginning of the timeless pieces you’ll find beneath the glass counters. The owners of Eco Estate Jewelry realize the benefit “reclaimed and upcycled jewelry has on the environment.” Their collections are creative, artistic, and good for our planet making it a perfect place for wandering, gift shopping, and treating yourself to something special. Independently owned since its inception, Eco Estate Jewelry began in a living room and has grown quickly to what it is today. Since they are constantly buying jewelry in the market, Eco Estate Jewelry is ever-evolving and always a unique place to shop. You will find something new and beautiful with each visit. The true magic of Eco Estate Jewelry is getting immersed in the stories behind what they sell. Lose track of time while listening to the intriguing tales like the one about an 18k Gold Luxe Pendant by designer Ivana Cella. As the story goes in the 1920’s-30’s, the Persian designer allegedly mounted the hand painted face of the pendant upside down as a symbol of the duress during the Persian and Iranian conflict. Our business was born on the premise that the world is full of beautiful pieces that deserve a second story and a new life. At the party celebrating the commencement of Eco Estate Jewelry’s second year as a brick and mortar Lakeway boutique, it was Mae West’s story everyone talked about. On display for the celebration, a trio of pieces once owned by the legendary actress who said, “without diamonds, honey, I’d feel under-dressed,” made all of us itch to pull out our checkbooks. Included in the collection were a platinum Edwardian era diamond necklace with a matching diamond link bracelet and wristwatch. My letter to Santa just got a bit longer. When diamonds aren’t your preference you’re sure to find another of Eco Estate Jewelry’s collections irresistible. Take for example the impeccable turquoise stones in their Native American Jewelry collection. The silver surrounding the stones is so flawless it looks as if it were just manufactured. Eco Estate Jewelry boasts an enviable collection of memorabilia, celebrity shoes, and artwork. The artwork in particular, lends to the eclectic ambiance you’ll find while shopping in this boutique. I had the privilege of meeting the man responsible for choosing which pieces adorned the walls. 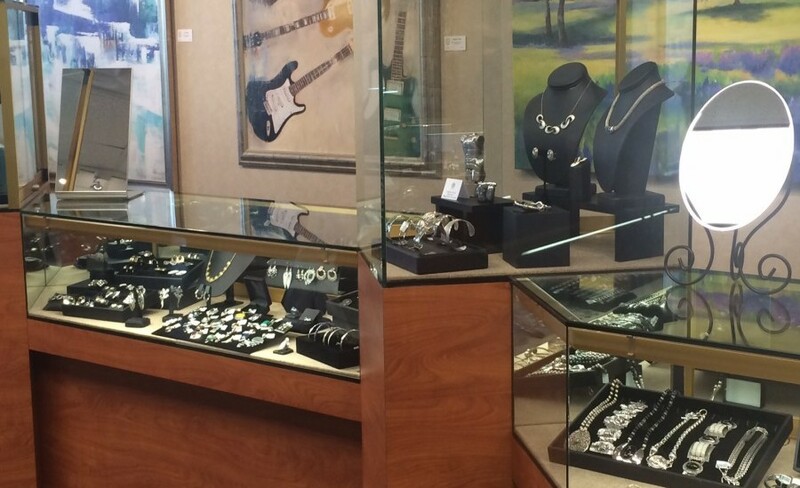 Ryan Adams, an art dealer with Adams Galleries, a little gem of Lakeway a few doors down from Eco Estate Jewelry, carefully selected the artwork that acts as the backdrop for the glass cases of jewels. My favorite piece — a stunning blue painting that draws your eye to the back of the store entitled “Shining Sky” — was created by a local artist named John Grimball. It’s these little details that make Eco Estate Jewelry such a special place to shop. The owners, Eric Hoffmaster & Alida Tallman love being part of the Lakeway Community for both their business and their home. Whether you’re shopping for yourself, for a specific someone, or for no one in particular, Eco Estate Jewelry’s one-of-a-kind pieces are sure to please. Follow Eco Estate Jewelry on Facebook to learn more about upcoming events and on their website to get a glimpse into the treasures you’ll find in their boutique. Katy is a full-time mom, writer, and Austinite. Apart from enjoying sunsets on Lake Travis, she writes novels for middle graders and has accepted the libraries challenge to read 1000 books to her four-year old twins before they start kindergarten. Read more about Katy here.